More Wildflowers in the Outback at Kilcowera Station. Daisies around Lake Wyara, the eastern boundary of Kilcowera Station. We are expecting the Royal Geographic Society here tomorrow, they have not had the best of trips as it rained all over the places they wanted to get to – Haddon’s Corner, Innamincka and Birdsville in particular but the rain has held off here this time and so they are spending 2 nights instead of the one they had originally booked in for. They started with about twenty 4WD vehicles and a 40 seat bus, can you imagine that poor bus driver trying to get that big heavy bus around on the wet dirt roads out there? A nightmare! Well, I’m hoping the visitors will be happy with our campground as it is looking terrific now, with the grass greening up as we speak. There are a few frogs about at the moment. 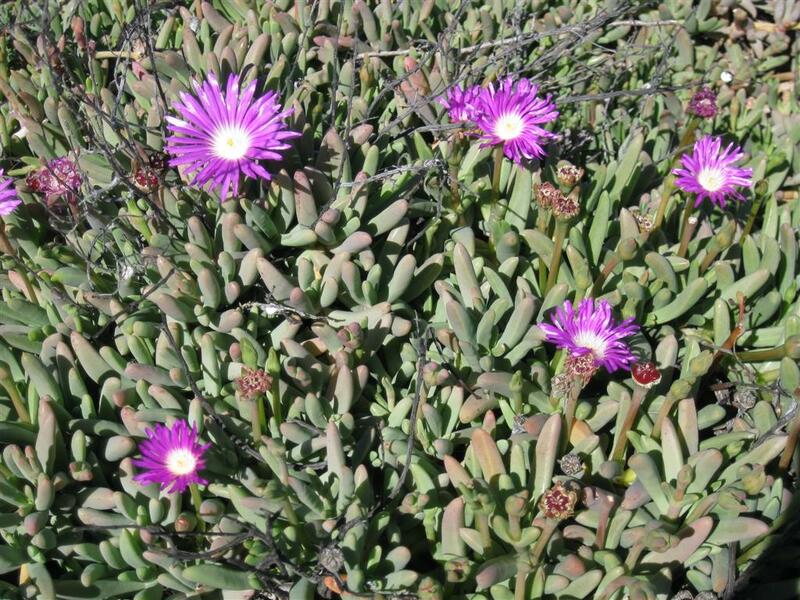 The pigface above grows in the sandy soils around the salt lake on our eastern boundary. This pretty little daisy is growing in large areas, forming a living carpet under Coolabah trees near the Shearers Quarters. Swainsonna microphylla or Poison Pea, is very common at the moment, growing in the table drains of all our roads. These wild little mushrooms were nestling under a pepperina tree in the garden, I reckon they are quite beautiful. I first found this plant growing at Kilcowera about 15 years ago, but have not seen it flower yet. I am 90 percent sure it is Hardenbergia violacea. I am going to have a look at it again soon and am hoping it is flowering so I can be sure. I belive it is way out of it’s range here. It lives in a relatively deep, dark gorge we call Rustlers Roost along with some other unusual plants for Kilcowera including, Sheoak and Weeooka. However I have found it in another place as well. The joys of discovery – I’m more of a plant person, Greg is better at the birds. But I did manage to flush out this nice Chestnut Breasted Quail Thrush for Dorothy and Bev. Thank you Dorothy for the image and I hope the weather is nice on the east coast! Wildflowers blooming at Kilcowera Station, Outback Queensland. The fantastically wet year we have been enjoying has set spring up to be a truly beautiful wildflower event through out our little corner of the Outback. It is amazing to see what comes up, and when, given the rain at different times over the years. We had good precipitation for the first 3 months of the year and then nothing much for the next 3 months (I was getting a bit nervous, thinking of the last 9 years of drought), but in the last 2 months we have had some good falls again. So much in fact that most of our station roads and airstrips have been waterlogged on and off during the last few months. Most of the insignificant little bushes have erupted into flower and look stupendous and then there are all the little wildflowers that just seem to come out of nowhere. The one below is Eremophila bowmanii ( Silver Tukey Bush) and the one after is gilesii or Green Tukey Bush. This post I am just going to show as many Eremophila bushes as I have photographed. Some of these plants are pests but you can nearly forgive them when they flower, they are so gorgeous. I think the one above is alternifolia and it is quite a long way out of it’s range, I found it growing on a high rocky escarpment. It grows on one long skinny stork of a branch right up through the middle of larger Acacia bushes, maybe for protection from being eaten by stock? All the ones I have seen are growing like that – through another bush. Eremophila duttonii or Harlequin Fuscia Bush, these have been flowering for months now, the birds love them. The one above is latrobeii and is a really neat little bush, would look great in the garden and comes in all shades of red, crimson and tangerine colours. Below is the rarer yellow flowering bush. Below is longifolia or Emu Bush and yes they do really love them and so do the birds especially the Mallee Ringnecks. The flowers range from a pinky peach colour right through to a brownish peach. And lastly another sturtii or False Sandalwood. Their colours range from nearly white, light pink, dark pink and lilacs and while they are becoming a major woody weed problem in many areas they are very showy when flowering. There are a few more Eremophilas on the place that I don’t have good images of yet including a newly discovered one called oppositifolia or Weeooka , glabra or Tar Bush, maculata – Spotted Emu Bush and polyclada or Lignum. The lignum bushes that survived the drought are now standing in water at the top end of Cardenyabba Lagoon, so I expect they will be flowering soon. Better go and mow the lawn now as more rain is predicted for tomorrow and if I don’t do it now it’ll be another week before it dries out again! Well at least we got a mail today – it has been at it’s unreliable best this year.